At the end of his relatively unsuccessful, season high 9th place finish in Belgium, 1973 season at the wheel of his privately entered Embassy Shadow DN1, Graham Hill hooked up with Lola, who’s car he had driven to win the 1966 Indy 500, for a two car attack on the 1974 World Drivers Championship. 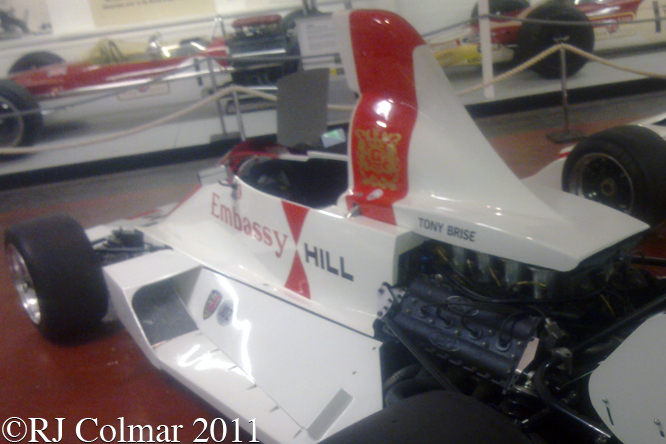 Embassy sponsored the building of the Lola T370 which was designed by Andy Smallman. 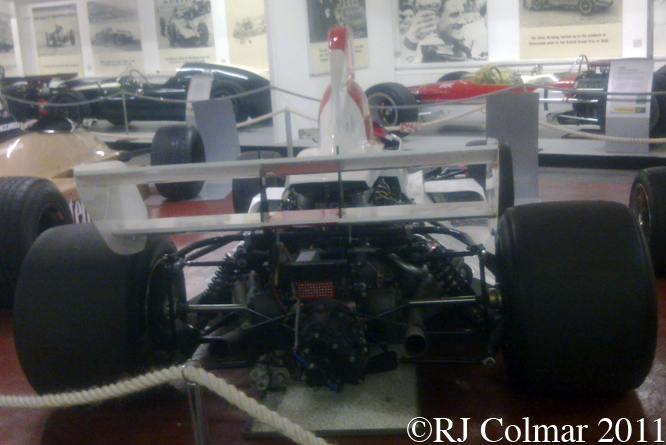 Unlike Lola T330 and T332 Formula A/5000 cars with rear mounted side radiators the T370 had the radiators mounted directly behind the front wheels, as would appear on Lola 1975 T400 Formula A/5000 car. 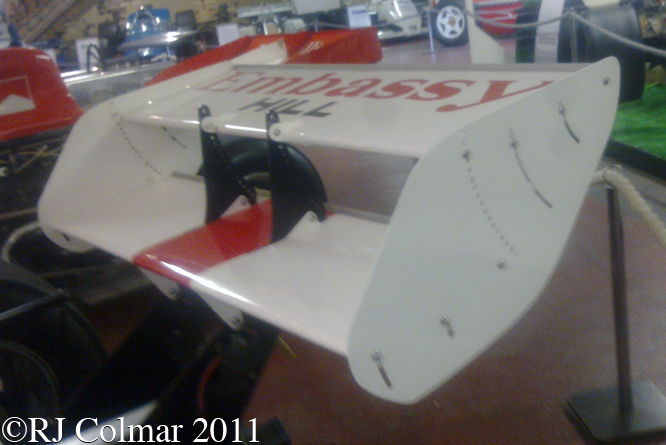 The most remarkable thing about the T370 when it first appeared was the outsize tall airbox which gave the car the appearance of a sail boat, much larger than the one seen in today’s photo as can be seen in this link. 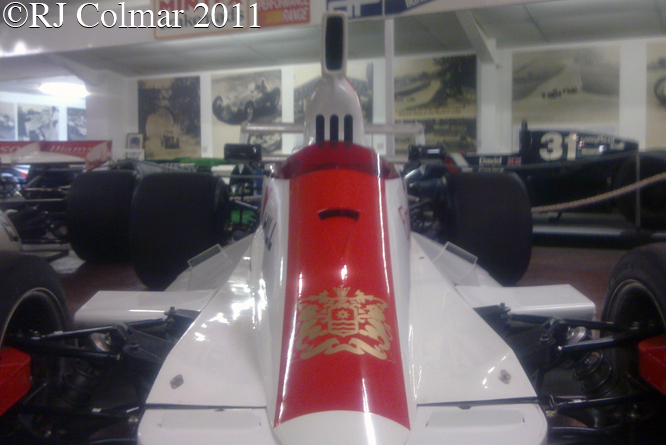 Graham’s efforts with the T370 were rewarded by a 6th place finish in the Swedish Grand Prix, but apart from that the over weight if reliable T370 was not particularly competitive as drivers of the second car; Guy Edwards, Rolf Stommelen, Peter Gethin and Vern Schuppan found out. 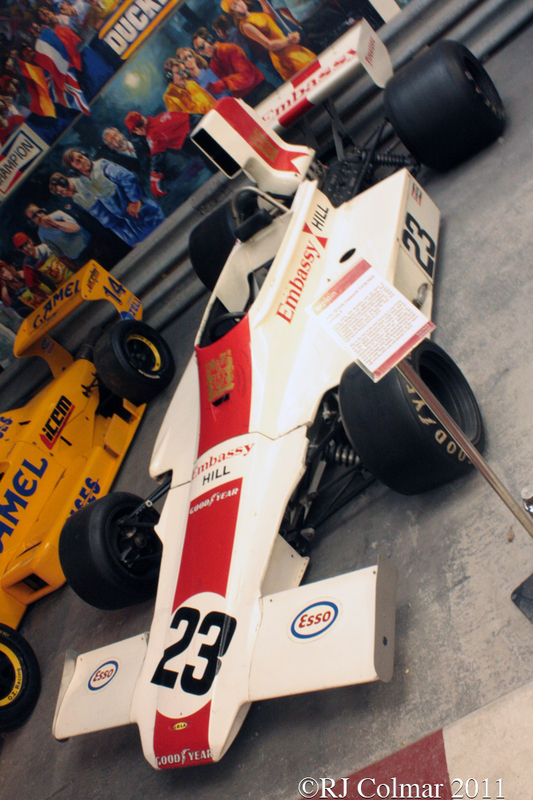 Guy Edwards scored a best 7th behind his team mate in the 1974 Swedish Grand Prix and German Rolf Stommelen repeated the feat in the 1975 South African Grand Prix. 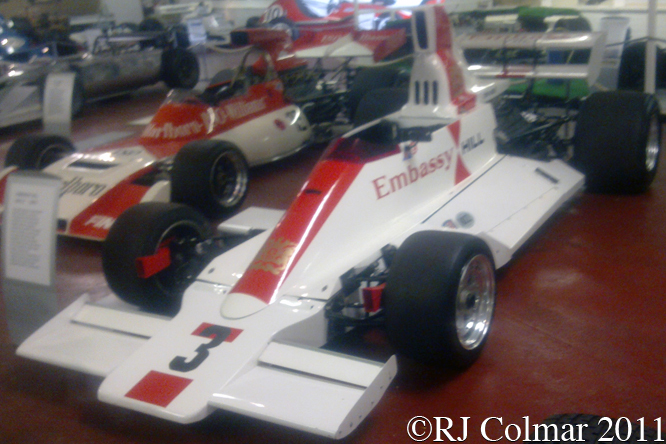 Today’s featured chassis HU3, seen at the Haynes International Motor Museum, first appeared as a spare car at the 1974 Spanish Grand Prix a role it remained in for 11 of the 14 events to which it was taken. 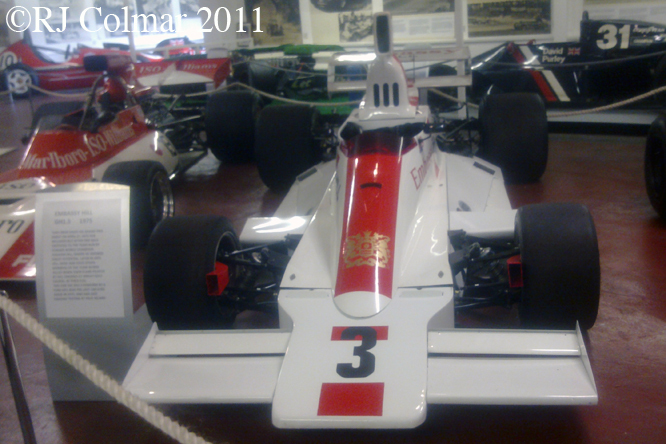 The car was first raced by Peter Gethin in the 1974 British Grand Prix where he qualified 21st on the grid but retired with a puncture. Rolf Stommelen then drove the car in the 1975 Argentine and Brazilian Grand Prix where he started 19th and 23rd on the grid respectively and finished 13th and 14th respectively. HU3’s final appearance was again with Rolf at the wheel during practice for the 1975 Italian Grand Prix at Monza. The T370 was superseded by a single T371 chassis in 1975 but as it dawned on Graham it was time to retire he decided to follow the lead of 3 time World Champion Jack Brabham and 2 time race winner Bruce McLaren to become a Formula One constructor. 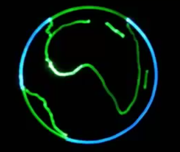 Thanks for joining me on this “Spare Smallman Embassy” edition of “Gettin’ a li’l psycho on tyres” I hope you will join me again tomorrow for Maserati Monday. Don’t forget to come back now ! 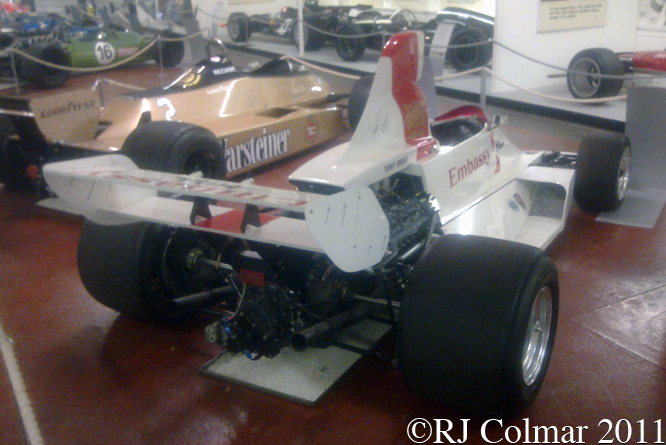 This entry was posted in Uncategorized and tagged Colmar, Cosworth, Edwards, Formula One, Gethin, Haynes International Motor Museum, Hill, Lola, Psychoontyres, Ralph, Schuppan, Smallman, Stommelen, T370 on November 9, 2014 by Ralph.